Sometimes, one scene makes an entire show click. In 24 City, this moment for me was when a buyer for wealthy ladies in Chengdu, China acknowledges that she will survive because she is the daughter of factory workers. Born in the 1980s, Zhao Tao is one of the final characters we meet in this poetic take on how China is shifting. 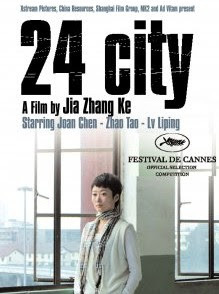 24 City focuses on stories from three generations of residents in an area formerly known as Factory 420. In a subtle mix of documentary and fiction film-making, director Jia Zhang-ke handles his subjects carefully, akin to a portrait artist, focusing on memories of migration and the lines around the lips. Quotes from Irish writer W.B. Yeats along with music from Chinese red songs, orchestral strings and Japanese enka add to this peculiar yet strangely comforting film about the transition of an aeronautical factory into a luxury high-rise complex. As I watched the film, I thought of the stories buildings contain. Once these places are demolished, do memories become rubble to be swept away?